Bubble Device #2 is an exercise in the serial creation of objects of intrigue. 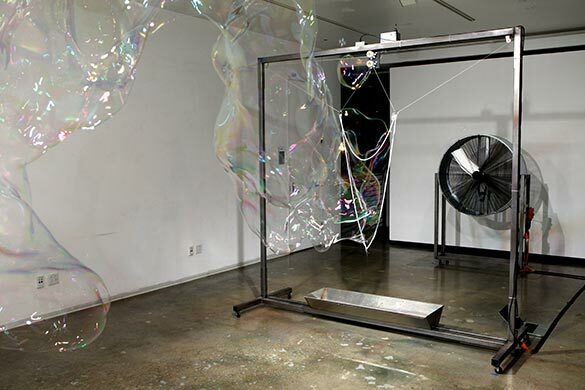 With the motorized control of an absorbent rope loop, a special liquid solution, and an industrial fan, the Bubble Device creates enormous bubbles. It brings us to a state of childlike wonder, in which we can sustain rapt attention, a precious state of mind in which we take in the world directly without evaluation or judgment. The continuously variable and undulating bubble forms invite close observation, and even the most staid of individuals is tempted to raise his or her arm, extend a finger, and pop a bubble. As children, we are fascinated by bubbles; we love to make them, chase them, and pop them. Bubbles are strange, and they ignore gravity, floating aimlessly with an incredible delicacy. They are gossamer structures that are simultaneously colorful and transparent. Unfortunately, as with all things in life, experience breeds familiarity, and our fascination with bubbles fades over time. Mr. Hanna is something between an artist, a designer, and an inventor. He uses his training in architecture to create devices, objects, and installations that explore the sensation of wonder and the essential relationship between humans and technology. He employs structures, materials, electronics, software, mechanisms, and space to create pieces that are a sculpture, an installation, and a performance all at once. His work often exhibits the aesthetics of utility, but it serves a contemplative—rather than instrumental—purpose. Mr. Hanna studied architecture as an undergraduate at McGill University in Montreal, Canada, where he was born. He worked in a small architecture office for a couple of years and then spent a period of time in Tokyo. He then went on to study at Yale University, where he earned a Master of Architecture degree in 2009. Since he graduated at the height of the economic crisis, he decided to move to Beijing. There, he taught introductory classes in architecture at the Central Academy of Fine Arts and worked at a local firm on the design of an airport in the Guizhou province. A fortuitous encounter with Chinese sculptor Niu Miao resulted in his collaborating on the development of an interactive installation entitled Candle Light. This then led to his next piece, Water Calligraphy Device, a tricycle-mounted machine that writes Chinese characters on the street using droplets of water. Mr. Hanna decided to become a professional artist, and he returned to the United States to earn an MFA in Media Arts at UCLA. After completing this program in mid-2013, he founded his own studio in East Los Angeles, where he is currently working on a series of new projects.